WASHINGTON, DC, October 28, 2013 (ENS) – The area covered by gold mining in the biologically rich Madre De Dios region in the Peruvian Amazon has quadrupled in the years from 1999 to 2012, finds new research published online today. For the first time, researchers have been able to map the true extent of gold mining by combining information from field surveys with airborne mapping and high-resolution satellite monitoring. The maps show that the average annual rate of forest loss has tripled in this region of southeastern Peru since the recession of 2008, when the price of gold soared. Until this study, thousands of small, clandestine gold mines that have boomed since the economic crisis had gone unmonitored in this region of low-lying Amazon rainforest. The research team, led by Greg Asner of the Carnegie Institution in collaboration with officials from the Peruvian Ministry of Environment, used the Carnegie Landsat Analysis System-lite, known as CLASlite, to detect and map both large and small mining operations. CLASlite differs from other satellite mapping methods. It uses algorithms to detect changes to the forest in areas as small as 10 square meters, about 100 square feet, allowing scientists to find small-scale disturbances that cannot be detected by traditional satellite methods. 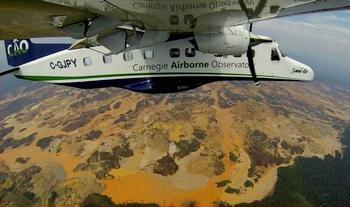 The team supported the satellite results with on-ground field surveys and data from the Carnegie Airborne Observatory. The field and CAO data confirmed up to 94 percent of the CLASlite mine detections. The Carnegie Airborne Observatory uses Light Detection and Ranging, or LiDAR, a technology that sweeps laser light across the vegetation canopy to image it in 3-D. It can pinpoint the location of single standing trees at 3.5 feet (1.1 meter) resolution. 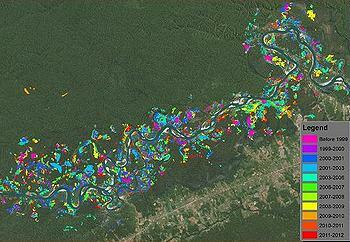 This level of detail was used to assess how well CLASlite determined forest conditions in the mining areas. The CAO data also were used to evaluate the accuracy of the CLASlite maps along the edges of large mines, and the inaccessible small mines that are set back from roads and rivers to avoid detection. In addition to damaging tropical forests, gold mining releases toxic sediment into rivers, with severe effects on aquatic life. Other recent research has shown that Peru’s gold mining has contributed to widespread mercury pollution affecting the entire food chain, including the food ingested by people throughout the region. Miners also hunt wild game, depleting the rainforest animals around mining areas and disrupting the ecological balance. The results of this study will not just be shelved if co-author Ernesto Raez Luna, senior advisor to the minister in the Peruvian Ministry of the Environment, has his way. As of 2012, small illicit mines accounted for more than half of all mining operations in the region. Large mines that were the focus of previous research are heavy polluters but are taking on a subordinate role to thousands of small mines in degrading the tropical forest throughout the region, the study shows. This trend highlights the importance of using this newer, high-resolution monitoring system for keeping watch on this growing cause of forest loss, the researchers say. The results of this research are published in the online early edition of the journal “Proceedings of the National Academy of Sciences” for the week of October 28, 2013.